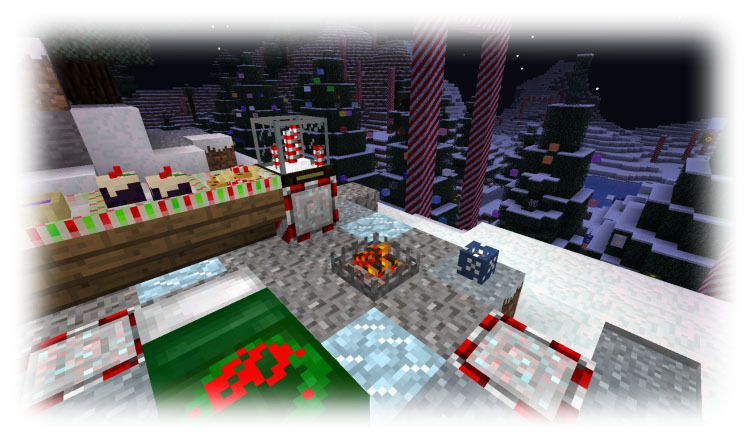 Christmas Festivities Mod(Christmas Furniture, Decorations) for Minecraft adds a new dimension called the Kringle where it is always cold and magical, and many Christmas-y items, decorative blocks, and holiday foods. It aims to help get your world into the holiday spirit. 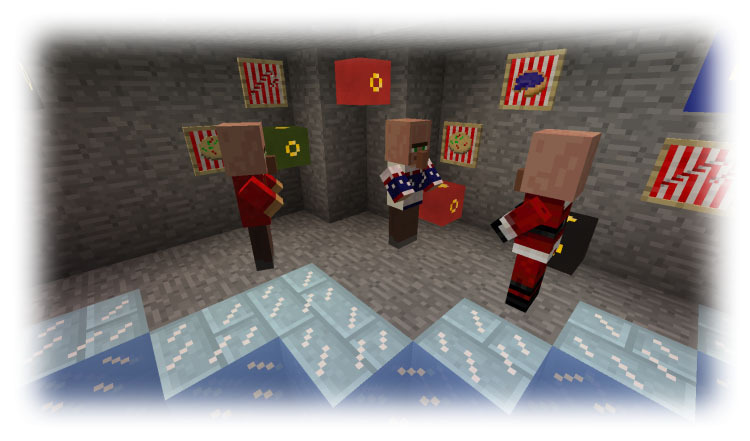 The Christmas Festivities Mod adds many new blocks to your game, ranging from snowglobes to pepermint poles. There are plates that you can stack high with treats, five varieties of cookies, Christmas pudding, and pies. Also it adds four new decorative ice blocks, a fireplace, and every few days there will be another snowglobe to decorate with. 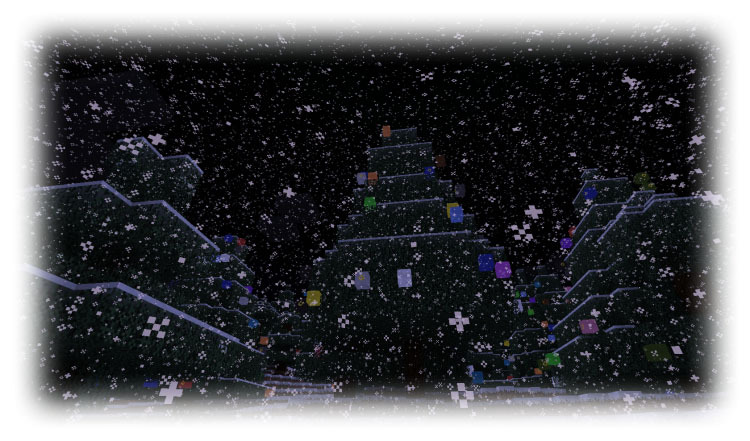 Top off your tree with ornaments and explore the many festively retextured areas of the world. It inserts new foods as the chocolate, that care one and half bar of hunger. It also inserts the hot chocolate, care three bars of hunger, and it does him with the chocolate put inside the furnace. 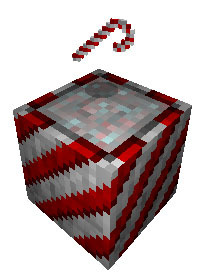 It adds the Candy Canes, care a bar and half of hunger, do him with the sugar inside the crafting table. It also inserts the gingerbread, care a bar and half of hunger, do him with eggs, sugar and wheat in the crafting table. It adds the Sweet Christmas tree, care three bars of hunger, and it does him with the chocolate and the wheat in the crafting table. With the gingerbread it makes him the gingerbread man, it does him cooking the gingerbread inside the furnace, care two bars and half of hunger. They are also there new new biscuits as the biscuits to form of reindeer and the biscuits to form of snowman, they take care of both a bar of hunger. There are new nine building blocks, lights, Christmas balls, a Christmas tree, new leaves, garland, candy canes, Christmas present, epiphany stocking and Christmas Tree Toppers. …The moon on the breast of the new-fallen snow. The mods best feature however, is a new world, the Kringle! The Kringle is a land of Holiday magic, with giant ornament laden trees, oceans of ice, and arching peppermint poles. With 6 biomes and many structures already and more on the way, the Kringle is a land of festive mystery, open to exploration!